InterFaith Health Clinic was founded in 1991 to help hardworking people in our community who don't have health insurance coverage. InterFaith has served over 24,000 individual patients by providing affordable medical, dental, and mental health care & access to prescription medications. With a paid staff of only 24, the clinic couldn't exist without its core of volunteers. Nearly 200 people volunteer their services on-site and over 400 off site-volunteers see our patients. Each year, more than 6,000 volunteer hours are recorded on-site. Doctors vs. Lawyers Trivia Night - Coming Up on June 20, 2019! 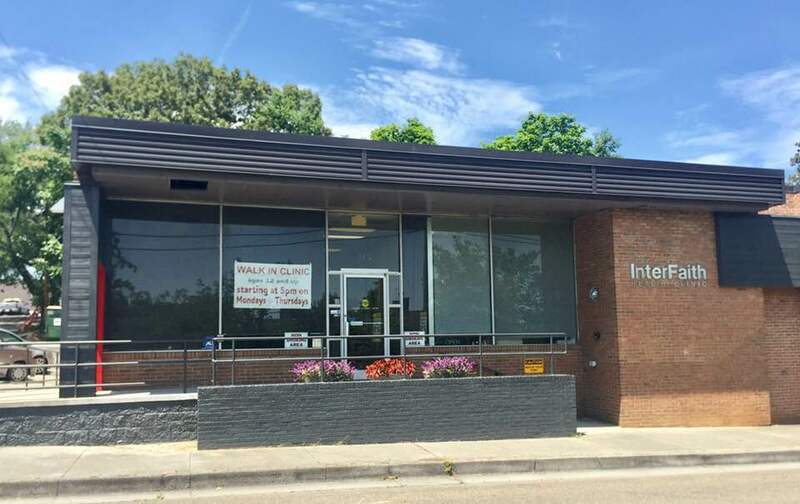 InterFaith Health Clinic is a not-for-profit health care ministry that serves the low-income, working uninsured and underserved. Here you will find a caring team of health care professionals who want to help you stay healthy. Our small paid staff is joined by a large number of volunteer doctors, nurses, dentists, and other specialists who volunteer their time for you and your family. We are not a government program, but we depend on the generosity of our entire community to help us provide quality health care you can afford. Listen as InterFaith's patients share their stories about how InterFaith helped them find health and hope when times were tough. 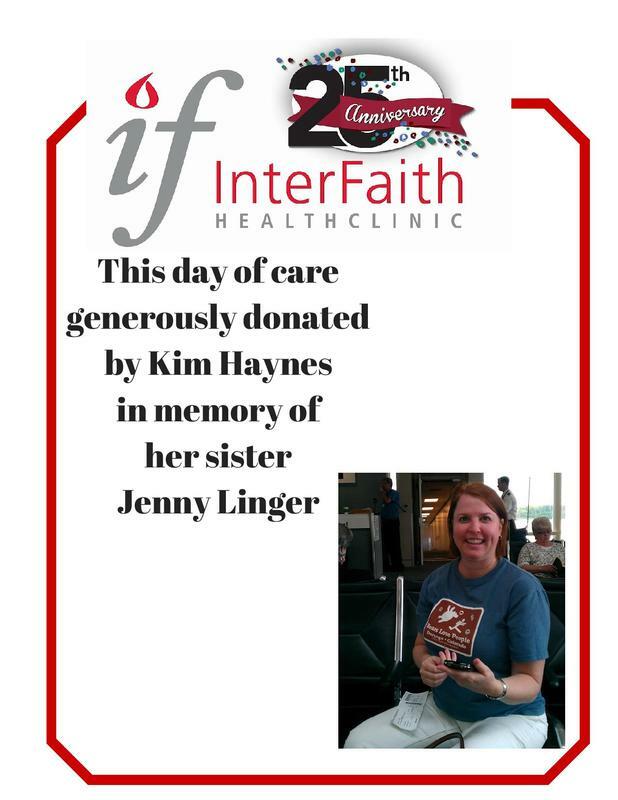 InterFaith's patients are so humble and grateful for the care they receive at InterFaith, which makes our jobs so much easier. Thank you, Ronnie and Janet, for sharing your stories! Did you know that donating can be as easy as shopping? It is when you shop Amazon Smile! Shop Amazon by clicking below and a percentage of your purchase goes right back to InterFaith! ​Sponsoring a DAY OF CARE is an excellent way to honor the memory of a loved one or to acknowledge a birthday, anniversary, or other special occasion. 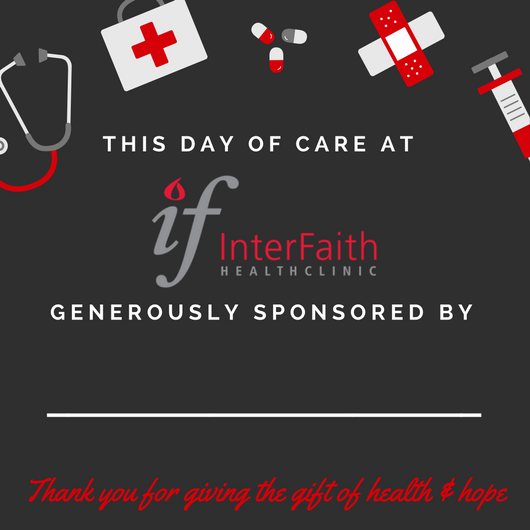 Donors who sponsor a day of care are entitled to a custom sign (like the one below) placed throughout the clinic as well as on our homepage and Facebook page on the day of their sponsorship. Click here to learn more.